England: New stadium plan by Coventry City? Another turbulence in Coventry, where stadium issue for Coventry City remains unresolved for the third consecutive year. Instead of Ricoh Arena the club now want to expand a smaller rugby stadium. Ricoh Arena is a stadium built particularly for Coventry City back in 2005. Except that, after serious conflict over tenancy, the building was claimed by rugby team Wasps in 2014. As it was at that point, now Coventry City are still trying to figure out the optimum plan for the future. 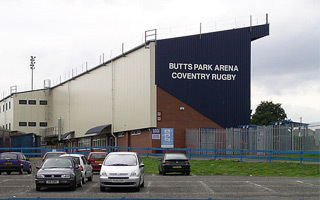 Most recent outcome is the proposal to relocate to Butts Park Arena. This 3,000-capacity stadium lies closest to the city’s historic centre and would be within walking distance for many fans. But it requires serious investment. According to the Coventry Telegraph, Butts Park could grow to 15,000, possibly even more. City are reportedly engaged in architectural design for this venue, seeking to share the ground with rugby side Coventry RFC. Sky Blues Trust, the largest supporters organization for City, argues the team might be better off at Ricoh Arena, but the fans aren’t against exploring all options that might secure the future of Coventry City. In an online poll for Coventry Telegraph majority of respondents (57%) answered the team should remain at Ricoh Arena. In case you weren’t with us back in 2013, Coventry City had already pledged to build a private stadium in a new location, but failed to deliver on these promises.